The Banni Grasslands of Kutch. After a complete SWOT analysis, we selected to visit The Rann of Kutch (greater as well as little) as our holiday destination and I must say it was a decision well made. The place is a must see not just for its avi-fauna but also for its cultural and geological importance. Gujarat is a colorful state, and perhaps Kutch still retains most color. People here are simple, helpful and very courteous, their attire enticing, their language sweet despite the hardships they face. 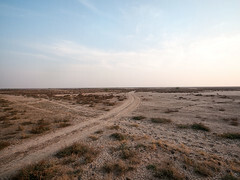 Our first destination was the Greater Rann of Kutch. We stayed at CEDO, Moti Virani Village. CEDO, the Center for Desert and Ocean is a trust run by one of the most knowledgeable persons about the region, Mr. Jugal Kishore Tiwari. Nearest to CEDO is the Banni Grassland where we spent a lot of time. We were wondering what the common cranes were eating from the ground when our guide on the first day, Mohammad dug out the tuber of Sedge and asked us to eat it. For something coming out of an absolutely dry, salty earth, the miniscule tuber was indeed tasty, and perhaps nutritious for birds and rodents if eaten in large quantities. We learnt that the place has a population of several thousand (an estimate is over 60,000) migrant Common cranes. Where do these cranes go at night was the question nagging our minds. There are several water bodies that fill up during the monsoons. The nomenclature of water bodies is interesting. The smallest of water bodies is called as Kar, Chhachh is bigger than Kar, Thathh is bigger than Chhach and Dhand would be the biggest of the wetland. While the smaller water bodies dry up the bigger ones like Chhach and Dhands survive the harsh summers of Kutch. Chaari Dhand is situated in Banni grasslands and has lot of bird activity. It is here that we saw Marsh Harrier hunting, Bar tailed Godwits fighting, several species of ducks, innumerous waders, and best of all, one evening we witnessed the thousands and thousands Common Cranes coming towards the lake to spend the night. They were calling to each other, flying in formations and landing smoothly, one group after another. We watched the show, awestruck for over an hour. The evening light carried with it the silhouettes of cranes and sun setting beyond Keero hill was a sight to behold. Totally magical. A conical hill, Keero is an important landmark of Banni. It overlooks the great Rann of Kutch, west of Chaari Dhand. It is also an extinct volcanic site and has several layers of fossil treasure hidden underneath. Kutch was undersea two million years ago and the area has is a rich resource for Marine fossils from the upper and middle Jurassic era (135 to 150 million year old). We were lucky to find some ammonites and belemnites from the dry riverbed. Our host, Mr. Jugal Kishore Tiwari showed us his excellent collection of over 200 fossil specimens from the region. 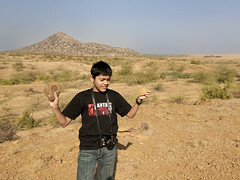 Aasim examining fossils, The conical Keero hill. After a hard day of fossil collection and bird watching, while we were heading back one day, we encountered a strange phenomenon. I had read about it, was curious too but had no expectations of witnessing the Chir Batti of Banni Grasslands. Four distinct pear shaped lights, one yellow, three blue, were twinkling at a distance of about 100 feet. They seem to vanish for some time, and then reappeared. Tarique said they could be night mirages, Aasim had his own theory of the gases trapped getting ignited by static electricity – but none of us was sure of what it was. The villagers simply call them Chir batti or Ghost lights. 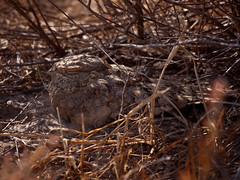 “These have not caused any harm so far and are a common sight in the Banni grasslands” Mohammad said. Mohammad, our guide on the first day, who belongs to Mutva community of Kutch, has spent many a years with BNHS doing fieldwork in Banni and ringing birds. A local, he has quiet a lot of knowledge about the region, birds and bird behavior. Few locals do farming here, as it is completely monsoon dependent. A few centuries ago they grew red rice and a several more crops through out the year at Banni, but now very few crops like til (seasame) and Castor are farmed and that too only during the monsoons. The locals essentially herd goats and camels and are friendly souls. Greeting one another whether you know them or not is very common. Honest, simple souls, these are the people of our country – they are rich in etiquette and wisdom which many of us, city dwellers, lack. The unfortunate earthquake of January 26, 2001 had its worst effect on this area, most families lost their children, and the pain is extremely evident when you talk about earthquake, any earthquake. More pictures of the trip can be seen on my flickr account. Many more pictures taken by Tarique are here. Excellent Swati! I appreciate your efforts..very nicely done.Thanks for sharing. Nice work . keep it up. Thanks Swati for this beautiful penning. You made me relive that past, of course I dont have the eye for details as u have. Hope u sighted the Flamingos. Thanks for stopping by, Prashant. My next entry is going to be on Naliya, Mandavi and Motwa beach where we saw flamingos -will try and finish writing it by end this week. Thanks to Twitter, I got to read all this. I must say, you are truly gifted writer, Great poems and very well detailed explanations. Was indeed a pleasure reading some of your writings! Thank you, Vishal, for your gracious comment. Glad you liked what I write. You have analyzed the in and out of the place. Chir Batti is something which i would also wish to see. It just shows that there are so many things beyond human mind to perceive. The shepherd looks so cool. I just wish i could be like him and live like him. And how true is your saying that the villagers have great wisdom and respect fellow human beings which we people who work in big corporates do not possess, but claim to, which is the worst part. But i have a big doubt about the post. Where is the Grass!!! 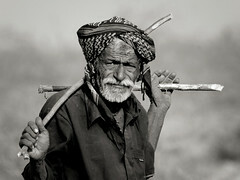 I am a widlife photographer..And i loved the pictures..but there is no picture of grassland..I didn’t understand..! If Banni is a grassland, then where is the grass?? 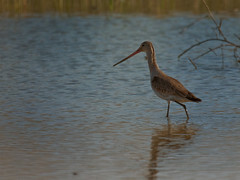 But i liked ur pictures…From the point of view of a wildlife photographer..
very good observation and photos.tfs. Next time you may try to visit some villages in Banni whcih are making traditional handicraft. I’m planning to visit Banni Grasslands on a really tight schedule (22-24 April) from mumbai. Do we need any permits to visit that place and can we traverse from Dholavira to Banni directly through the white desert via dhordo or bhachau. Thanx in advance. Hi Rahul, As far as I know, no permits are needed -they weren’t when we went there. But you may want to ask your hosts about it. I got this via email from Kantilal Dooblal ji. HTH. One need Photo ID zerox and have to fill the form provided by Police Office at Bhirandiyar village first village beyond that every body needs police permission. It coast to visit white rann of Kutch Per person Rs.100 vehicle 50 and child 50/=. I have emailed it to you. Have a good trip. Good work! When it comes to Kutch..it’ll be more more and more..endless! I am an enthusiast photographer from Mumbai and am planning a trip to Kutch, mainly for bird photography. I am planning to self drive from Mumbai. Your report has been of immense help, as I am looking for focused areas for photography. Unfortunately, I have limited time, about 5-6days, for Kutch. 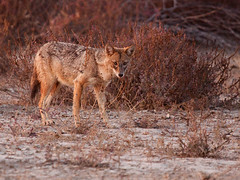 I need help to know the places in the Rann and Little Rann, and even other places (like Motwa which you have mentioned in your next article) where I have the best chances with photographing wildlife. I am not a birding expert and have embarrassingly little knowledge on bird species as such. My main interest is photography. Again, I’d like to say it’s an awesome blog and of great help to enthusiasts like me. Are you a scientist ? Nice work. Did you see GIB ( Great Indian Bustards ) in Kutch ? Did you see Banni Hounds ? I am sure, your tour Guide Mohammad would be knowing about them. They are kept by Maldharies ( shepherds keeping cows, buffaloes ,Goats, Sheep and Camels ) They are very strongly built sight hounds, good watch dogs and hunters of hares and black bucks. Tan/deep tan in colour, longer in proportion to height and ferocious watch dogs, guarding their masters animal herds. I had a pair of this breed 50 years back, when I was a boy of 13 at Jamnagar. I got them from a passing by Maldharies group. In 2004/5, I had seen some of the poetry of Dr.Zarina sani and communicated with you through a web site through internet, If you and Mrs. Zarina Sani are from Nagpur. * I got a book consisting of famous Ghazals, Co authored by a Dr., A Medical Practitioner , from your end through VPP. ** -.I would like to get her ( Dr. Zarina Sani’s ) book/s if written on the samples and examples of Urdu Ghazal Meters. _ Vitthal Gharpure / 02-12-2012 / Sunday. Grass was as high as 5 feet and road was not seen by new visitors but only experienced person could guide to roads to villages of Banni. At earlier stage this grass land was habitating the wild animals like Chitah and LION in those wild land of grass land of BANNI. Now the GANDO BAWAL, wild acacia has taken over the grass land and grass is only in interior parts of land but now everyone making a forced farming land and grass is disappearing/burned, and rest taken over by Thorny wild Bawalds – wild acacia plants. hi, swati, i know you dont know me, sorry to comment but , do you know few more thing about Banni grassland, it was in past asia’s biggest grassland, same time it was having asia’s longest rice production, which names shali. do u know this grassland had its major two parts? DO ANY BODY KNOW KUTCH HAS ITS 24 TYPES OF STITCHES AND WHICH ARE IMPLEMENTED IN KUTCH WOMEN AND EARN MONEY FOR THEIR FAMILY WITH THEIR TINNY STITCHES ! Thank you, Kantibhai. I saw the facebook page and the embroidery is very fine and beautiful. Swati Ma,m, I am a student of architecture and want to go to Banni and stay with the locals there as a part of my case studies on earth architecture and artist village. Please let me know how did you get there and where did you stay. Sneha, you can get in touch with Mr. Jugal Kishore Tiwari, and I am sure he will be able to help. Glad I could help 🙂 Good luck.